The venues for fast food in Barcelona are not just limited to McDonalds, KFC and Starbucks, plus a few local chains such as Pans&Company or Viena. There are instead many local holes-in-the-wall and bars where you can get delicious (and even healthy!) fast food where you’ll want to go back again and again. And the truth is that when you are sightseeing, you don’t often have time to seat down for a 1-hour Spanish meal. That’s when fast food is so convenient! 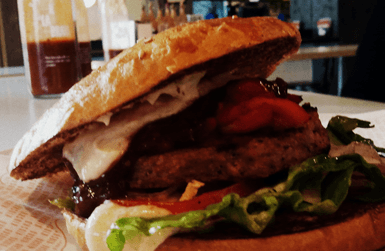 So today we’ve compiled our favorite fast food restaurants in Barcelona, so you can maximize your sightseeing time but also enjoy a delicious fast meal. Enjoy! If you happen to walk across Plaça Sant Jaume on a Friday evening, you’ll see a long line of youngsters coming from a tiny sandwich place: This is Conesa, the best place in Barcelona to eat delicious hot sandwiches. 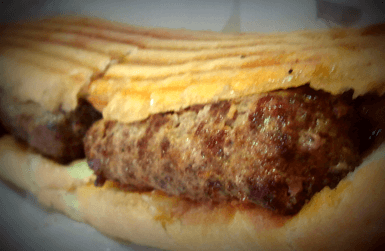 They are prepared on a grill specially designed by the owners and they are cooked without fats. So, in addition to exquisite, they are healthy. And they also have gluten-free bread. The fast food barcelona scene wouldn’t be the same without Conesa. This another mythic fast food Barcelona places. A must for hotdog and sausage lovers. Their secret? The high quality of the meat they use. From outside, it just looks like one more fast food place, but once you start eating, you really feel you are in an authentic place. It’s different and great! Locals often take their hotdogs away to enjoy at home. This is probably one of the most surprising fast food places you’ve ever been to. Really, a meatballs place? But try them, and you won’t forget them. They prepare them with many different ingredients (even some veggie ones), at a really good price. And guess what: they make some great chocolate balls for dessert! These last years, more and more market stalls have started serving food to go in the market, so it’s become the place that concentrates the biggest variety of fast food in Spain. 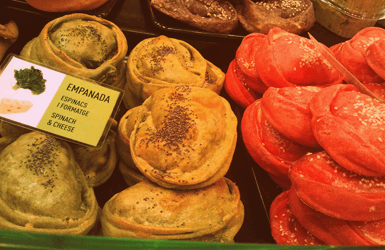 In the right section of the Boqueria you’ll find crepes, empanadas, tex-mex, vegetarian and pizza stalls. Instead, in the left hand side there is a Greek shop, and towards the bottom left you’ll also find a couple of Asian food places and our favorite: Ramon, a small counter serving Catalan and Spanish food to go. Don’t miss their skewers and their croquettes! BTW, that’s just the stalls, but the Boqueria tapas bars are the best fast food Barcelona has to offer. AND BONUS! What about burgers? You won’t find a better hamburger in the whole city. The quality is the most important feature of this place, that offers many different varieties of burgers. You can choose the type of meat, the extra ingredients, the type of bread buns… Hamburgers with a touch of modernity AND hand cut fries and homemade sauces! Need more ideas? Take one of our Barcelona food tours! So what about you? Head to the comments below and tells us: what are your favorite fast food Barcelona places?